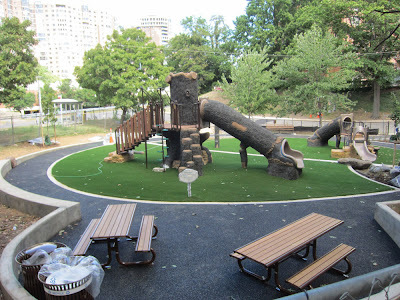 The opening of the new Ft. Myer Heights children's playground looks to be only days away. The playground is truly magnificent. Without a doubt it's the finest children's playground on the eastern seaboard of the United States. When you think of fun, think of Rosslyn. i'm wondering if the mysterious glass survived this renovation. That's really all that matters. What do think your cost is for this "Wonder", tax payers of Arlington Co. ??? The total budget for the playground was $559,000. Construction of the playground didn't reveal any information about the historic glass recovered there earlier. Any additional glass at the site is now buried beneath the new surface. We are playground construction specialists and one of our core business activities is the installation of wet-pour in-situ safety surfaces, we can assist you with any element of your outside play area requirements. Soft Surfaces services also include the design, construction and maintenance of a range of sports facilities including synthetic grass pitches, multi use games areas and athletics tracks. Sudscape is SuDS (Sustainable urban Drainage System) certified, because it’s a porous area that enables water flow through easily. The Sudscape permeable paving remains porous throughout its life span with minimum prep work needed for the sub base that is set up over type three aggregate follow this. Excellent A-1 Auto Transport incorganization to utilize. Booked right before the actual Christmas vacation plus they still could obtain my vehicle picked up from Atlanta the following 7 days and delivered to Utah. Price had been reasonable plus they hired a great car owner, would definitely use them once again.